Like an owl, you would like to make the night a day. This is common to those who are involved in night shifts or night duties. When we talk about graveyard shift, what comes into our minds first are call center agents, though there are so many people who are working at night in restaurants and in front of the computer. 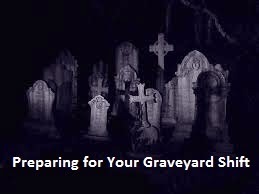 You have to prepare for you graveyard shift because it is very risky for the health. You might think that you are still alright right now, but in the long run, you will suffer from the sickness that you might get from being unable to sleep in the evening. Prepare for your graveyard shift by taking enough sleep during the day equal to what you are supposed to be spending in the evening. Your cells will be worn out and stressed if you will not do this. The cell is responsible for mitosis which results to its duplication necessary for growth and healing. Imagine if your cell will not unable to duplicate. It would be a big problem. Also, it is advisable for you to eat well – and eating well means taking in the right kinds of foods. Fruits and vegetables are good to eat plus your vitamin intake. As long as you know how to protect yourself from the threats of graveyard shifts, you will be on track. And look at yourself always in the mirror. If possible, have a monthly checkup of your health for you to know your status. Remember that your money is useless if your healthdeteriorates.